Since I have an abundance of figs right now, I am trying to eat them daily, which isn't hard for me to do. This is a wonderful recipe for spiced figs. 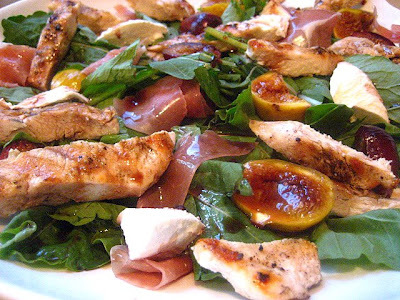 You can use the spiced figs on pound cake, drizzled with the syrup, or in this delicious salad of bufala mozzarella, arugula, prosciutto and spiced figs. The balsamic vinegar and red wine boils down to make a rich, spicy syrup that is out of this world. I omitted the star anise, because I couldn't find any. 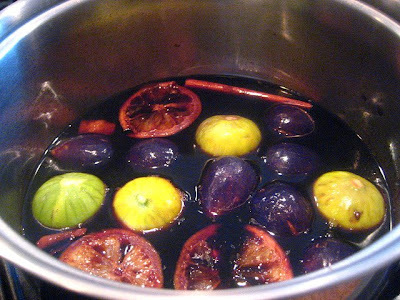 Place all ingredients (except figs) in a heavy saucepan and bring to a boil. Add the figs and simmer for 3 minutes until figs soften slightly. 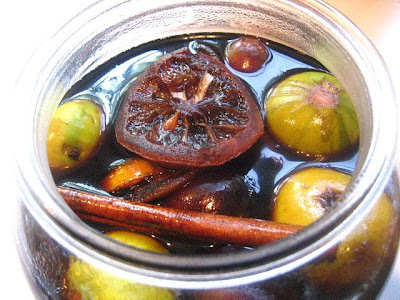 Remove figs with a slotted spoon and transfer to a glass bowl or glass storage container. Continue simmering the liquid for another 5 minutes or so until syrup is starting to thicken. Pour over the figs and let cool completely. Take some figs out of the syrup and slice in half. Arrange on a platter with the salad ingredients and drizzle the fig syrup over the salad. Oh wow,I've never seen or heard of spiced figs. I'll bet these would be dynamite on your upside down cake too. I like the spices here - I had a fig in a NY restaurant the other night that, surprisingly, tasted a little bland. This marinade would wake things up. I saw the title in my dashboard and knew this was one of your recipes even before I scrolled down and saw your name. I had a few figs off the tree in the yard yesterday. Love those figs too. OMG those figs sound absolutely amazing! I love all your fig recipes. I should be getting a bag from my neighbor as soon as they are ripe. And believe me, I will be searching out your blog for all your recipes. Oh man, i'm so bummed. Last year my parents had soo many figs and I didn't know what to do with them. All recipes I found called for dried figs. They moved yesterday and won't be there for the figs in September. They will be planting one in their new yard but who knows when we'll see figs. This looks fantastic! I've never had a fresh fig. They sound tasty though, particularly in that salad! Heavenly is the perfect word to describe this salad - it looks wonderful Stacey. I am feeling so fig deprived. What's up with that? I cannot find fresh figs, even at Whole Foods?! 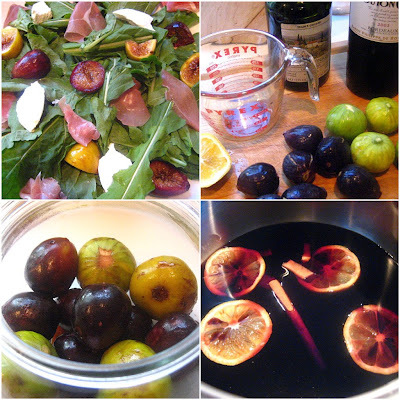 So, I can only drool over a concoction that looks perfect-- balsamic and wine? Yeah, that's perfect...and I have every stinkin' ingredient except fresh figs! Waaaaaaaaaah! Oooh I love your twist on figs here! We both have figs on the brain! Those figs look wonderful. I can't think of a better combination than pairing them with prosciutto and mozzarella. I can't wait to try this. I don't think I ever made spiced figs. I am so making a fig & spice jam or chutney in the coming weeks! You are an inspiration. It looks heavenly! Spiced figs! You're over the top!